As runners we can be pretty hard on ourselves at times, when we probably shouldn't be. At the same time, many runners may find they don't quite believe they worked hard enough. So, this post is purely to give a little food for thought on the subject. As for, if there is a right or wrong in any aspect of it, well that is up to each individual runner to decide. As, all runners come in different shapes, sizes. All have different goals, speeds. Every runner out there is awesome, and it doesn't matter if they come in first or last, they are after all out there running and for that it deserves some respect! 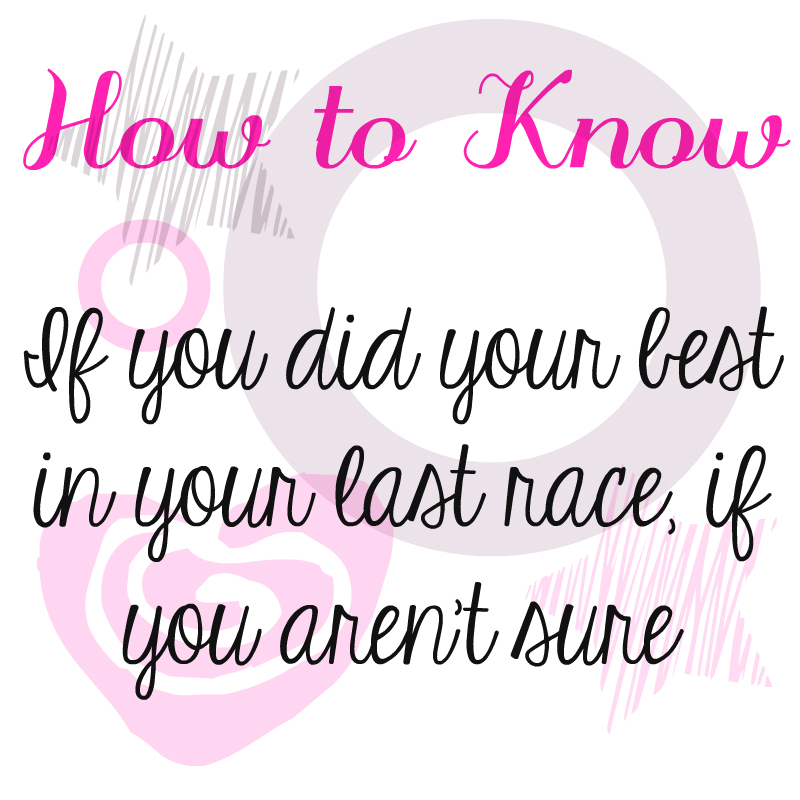 How do you know if you really did your best? Was your best good enough? Could you have done better? Or are you being too hard on yourself? Or maybe should you consider be harder on yourself? Asking yourself a few of these questions below MIGHT get you the answer your looking for. I finished my race, and missed my goal time by X amount. Did I do my best? Maybe I could have done more??? If you find your asking these questions after your race, try asking yourself these. Did you put in all the training time needed, not rushed? Did you put the miles and/or speedwork in ahead of time in training to get you to your goal you wanted to achieve? Were you healthy, injury free the day you ran the race? Did you remember it was a race, did you push yourself as you practiced in training? Did you put it all out there, as you crossed the finish line did you feel you gave it the best you could the entire race? In your training, did you train for the terrain and climate the race had? If you answered YES to all of those. You did your best, you gave it your all, there is no reason to come down on yourself or put yourself down for not doing better. Be proud of your AWESOMENESS, because you did the best you could do. If you want to do better in the future or hit higher goals, go back to the training board and start a new training program that will help you achieve the different goals you want to hit. If you answered NO to any of those above. Then there is your answer, right in the question you answered no to. You can still be proud of your efforts, as all efforts are something to be proud of. But try not to come down on yourself, because if you didn't put all the work in ahead of time or didn't train correctly for the goals you wanted to achieve. Those are things that are definitely something that is easy to work on for the future. Maybe knowing you can do better will be the exact thing to drive you and push you harder in the future. If you were sick or injured, that is something totally and completely out of your control. So its best to never feel let down about how a race turns out in situations like those. Not every race will be this way, and you can just look forward to the next when you are healthy without the uncontrollable holding you back. The key is to be happy with how your race ended. After all unless your an elite athlete your out there doing it for fun, and doing it mostly for yourself or as inspiration to others. If you want to do better, next time put the work in, do what it takes to hit new goals. After all, that is the great thing about running, you can try again! Why am I not getting faster? Is it even possible for me to get faster? Did you build up your mileage first and did you get very comfortable running the mileage before you began any speed work? Did you do speed work? Did you practice in training to push and build yourself to new speed levels, and trained for the race pace you were hoping for? Are you running consistently, are you training enough? How is your weight, are you at a healthy weight for your body height and type? Are you training specifically for one race, to hit your goals? Or consider taking a look at the races you are choosing, maybe they are not suited for you based on your training or where you train. Also, so many runners these days get caught up into race after race and forget that the body needs time to heal correctly. It can become impossible to train for PR's if you are racing too often and not allowing the proper recovery time and training to make it for one big goal race. If you answered NO, to any of the above, then POSSIBLY you aren't putting in enough work. Getting faster is possible for most anyone but if it was easy then let's fact it, everyone would be running sub 3 hour marathons or 15 minute 5k's. Instead, look at your weight, do you need to lose a few pounds? Those extra pounds lost can actually shave minutes off your time alone with no additional effort or training than you are already doing. Are you working on distance and speed at the same time? Because if you are, you are already training incorrectly, you should always work on distance first, then after you can start on speed, never both at the same time as it can easily bring on injuries. Maybe you are running too many days a week and over training, adding 1-2 rest days weekly are actually needed for many runners to run at peak performance. Or maybe your running too few days a week, you can't hit most goals if you are only running a day or two a week. Re-evaluate what your doing, and consider your options and come up with new plans and goals, after all that is the beauty of running we can always go at it with a new approach until we figure out what works best for us! Those are just a few examples of questions and things to consider if you find yourself wondering if you did your best or if you can become better. Because let's face it, we are only human and those thoughts come through likely many runners minds from time to time or after each race. However, not everyone has it in them to push and PR and shoot for goals, nor cares to. If you don't then just enjoy your runs. Fun runs can be just as satisfying if that is the type of running your into. The key is train properly regardless of fun or goals so you don't risk injury or death but I think the most important part is to just have fun. Enjoy the fact that you can run, because not everyone can! Have you ever asked yourself if you are doing your best? What process do you use to narrow down the problem area's you want to work on in your running? Such good points! I think focusing on distance OR speed is a good one. Another thing I had to realize is that running isn't ALL about the numbers. I refocused and started finding joy in the process of just running. These are great points! I do a lot of races and they all have different goals. They're not all for PRs or time. But when I've chosen one for time, then I know in advance that's the time to push and give it my all. Weeeelllll....I'm heading to Big Sur with plantar fasciitis. I've been pool running the last couple of weeks with a few runs on the road. My foot is my quieter. But if I answered your questions above, I'd have a 'no' to the injury question. I can't accept that I'm not doing my best. I'm going to the race fully prepared to finish. It's not the way I envisioned running this race, nor is the ideal training plan, but I'm going to give it what I've got. And so yes, that's my best. I get frustrated that I dont feel like i'm getting faster.... but I have to see that my endurance is getting better. its about the little improvements & focusing on those. This sure rings a bell. I am always wondering when I don't do well (like my last race) if I do my best. I don't do a lot of the things I should to get faster so I should be satisfied. I also know that being fast is not always the most important thing. I train for long races so I have to accept that I may not be fast on the short ones. I am glad you said this. It made me realize my sentence about about the injury part may have come off not how I intended it to come off. So thank you, it allowed me to realize I needed to go in and edit it to give the impression I meant, not how it looked before! As I totally agree, each race we have different goals and each race may bring us different limitations, but with injury of course whatever happens is the best we can do, that is one of the factors that is something we can't control. But can still be proud of our efforts regardless of our outcomes. And who knows, maybe that adrenaline will kick in and you'll have a pain free running day at Big Sur. It's an awesome marathon, one of my favorites I hope you have an incredible time!! I also think it's awesome you can run with your Plantar, I've met so many runners who have been sidelined from it for many years, like I have been with my foot tendon issues. It's such a hard thing to come back from, I think it's incredible you have!!! Good luck in the race!!! My very first coach (dad) who was an awesome running, pushed that one into me since childhood. Distance and speed building should never be mixed, it's a surefire way to get injured or burned out too soon. I totally agree, running isn't about the numbers. I think when we go out on training runs and everything just feels great and right, sometimes those can happen to be some of our favorite moments in the sport! I'm like you, when I race I either have different goals for each one, or I just go in it to have fun and do the best I can at the time. While I like to try my best in all, sometimes different situations and training have made my best less than I wanted, but I always try to remind myself its never good to beat myself up for something that didn't go the way I wanted. Endurance is huge. I am built more for endurance than I am for speed. I wish it was the other way, but for me speed requires a significant amount of effort, moreso than for those it comes easy to. But on the plus side, while someone may be able to pass me quickly, I can usually last longer and go further than them in the long run. But I agree the little improvements is a great way to focus our minds onto! I think we all do that, in fact that is the reason I came up with this idea for the post. Because I often even in training feel I am not doing my best and sometimes I have to remember to refocus and look at things in the bigger picture and be happy and enjoy the journey! Years ago (more years than I am going to admit to, LOL.) I used to do quite well and I could pick races that I knew if I pushed it hard enough I could win or place. But even when I did, I'd still look back and say, I wonder if I pushed harder here or there what I could have done. I think it's human nature as a runner. But I look at it as there is one sure thing in running, there is always going to be someone faster, and always someone slower. How I do is up to me to a point, but regardless I need to start enjoying it and not being so hard on myself. great post! I think we can all relate to this in one way or the other- and you are right we have a tendency to be a little hard on ourselves! You did your best, you gave it your all, there is no reason to come down on yourself or put yourself down for not doing better. I ran the 15k last weekend...did amazingly based on weather, kness, etc and yet a friend of mine ran faster than me and I am like...shiz I am faster than her..why didnt you run faster Tamieka....She didn't even train.....etc. uugh!! I honestly don't think i've ever been disappointed in any race I've ever run. I think it helps that I try to stay positive no matter what and even though i've been injured for several races I've never had an all out horrible race. I've recently started to make other goals for myself other than the ultimate finish time goal. For instance, I did not finish in the time I wanted for my most recent marathon but I did finish 10K, 10 mile, half, and 20 miles in the time I designated. So I fell short the last 6.2 miles, o well. Those last 6.2 miles did not define my entire race. I guess i'm being a little long winded here..lol. Yea, sometimes I feel I could have done better, but in the end I know I did the best I could at the time. Considering the circumstances (unless I just gave up, which I've never done yet). We talk about this a lot in our running group. it's easy to lose sight of the reasons why we do these races. Most of us are running for our health and happiness and not bc we think we will become the next sponsored athlete. We can learn a lot about ourselves from racing. After each race, I always look for ways I could improve like getting through trail race aid stations faster, but I'm not too hard on myself either - knowing I probably did my best! Great food for thought here, Kristy. As I reflect on the way I raced when I was a newer, younger runner, it's often quite different than the way I race now. Back then my training was impeccable and I left everything out there. Now I'm in it for different reasons. I'm just enjoying it. Not to say hitting PRs is not enjoyable because it certainly is. Great things to think about! I do go about each race with different goals and sometimes I am hard on myself but then I do think about why I'm running. I definitely enjoy the fact that I can run and have fun because you are right that not everyone can. I love this post! I had a wonderful time in my last 10k race but was a little slower than I'd been in past races. This gives me some great things to think about to prepare for my next race. I've loved every race I've done, but there are a few I know I didn't do enough ahead of time to achieve what I really wanted! I agree with you, staying positive is one of the main key's to happy running! Agreed, its very easy to loose sight of the reasons we run races. I think every race teaches us something, that is one of my favorite things about running races, the learning process from them! I agree, every few years the running goals change, and have to change. No matter our goals as long as we are enjoying it, that is all that matters! I think we all get hard on ourselves, but as long as we are enjoying it and having fun with it, no matter how hard or not hard we push ourselves, that can be the best part! Glad you liked it! I find each race can teach us things, and no matter our goals if we learn from ourselves it can only help us better prepare for the next one!